DIY house number with flowers - Lovely Etc. The last few years I’ve been working away transforming the inside of our home into a happier, fresher, and more welcoming place. But during that time I haven’t done a thing to the exterior of our house. Curb appeal? What’s that? Seriously, the front of our house is incredibly dated and unwelcoming and I decided it was time to finally do something about it. For the last few weeks, I’ve been working behind the scenes to completely update our front entry. 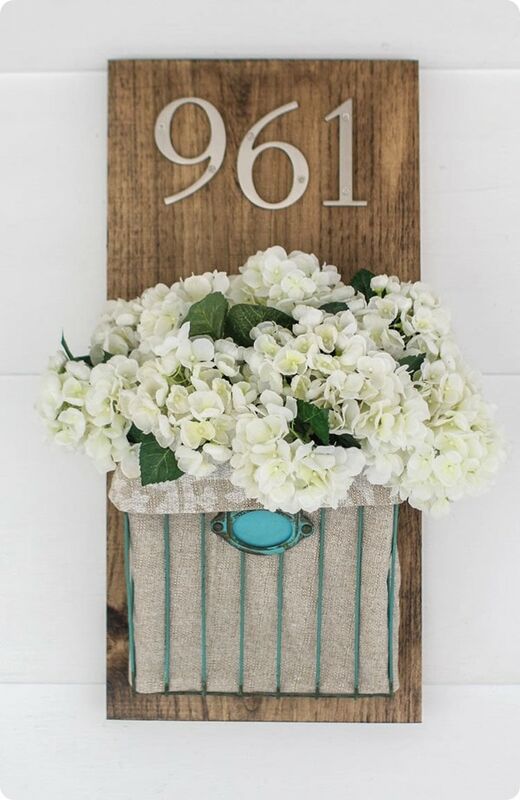 I’m almost ready to reveal the entire makeover, but in the meantime, I have a really fun DIY project from the space to share: my DIY house number. But first, here’s a look at where this all started. This is what I came up with. I’m kind of in love with it. Putting this together is really simple. 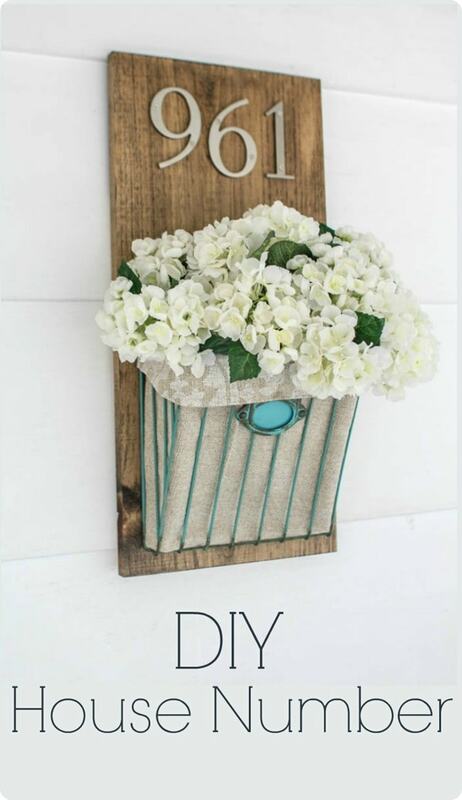 First, stain your wood board. 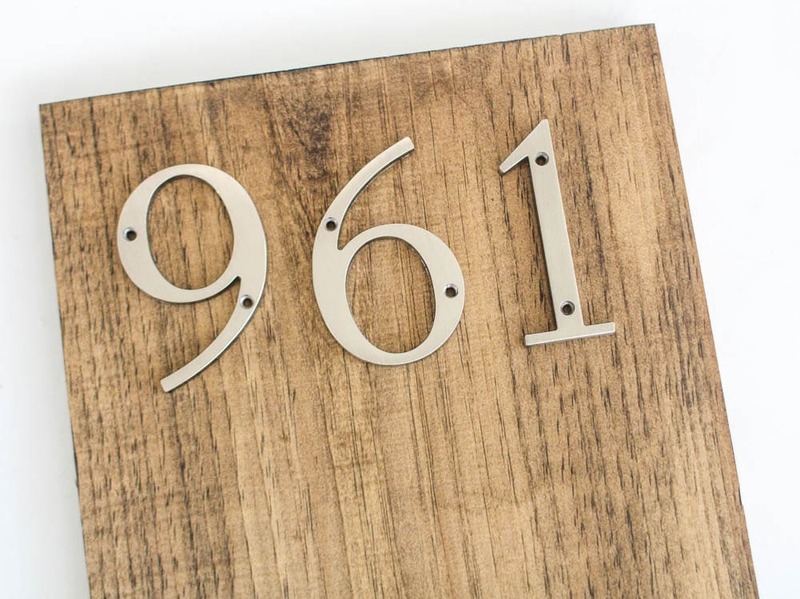 You can choose any color stain you like, but you want to make sure that your house numbers show up very clearly against whatever color you use. I ended up using a mix of Minwax Weathered Oak and Minwax Jacobean. (Those were the two colors I had on hand. One was too dark and one was too light, but together they were just right.) I wiped my stain on with an old tshirt rag, but you can also use a foam brush if you choose. While the stain dried, I made a fabric liner for my metal basket to hide the flower stems. 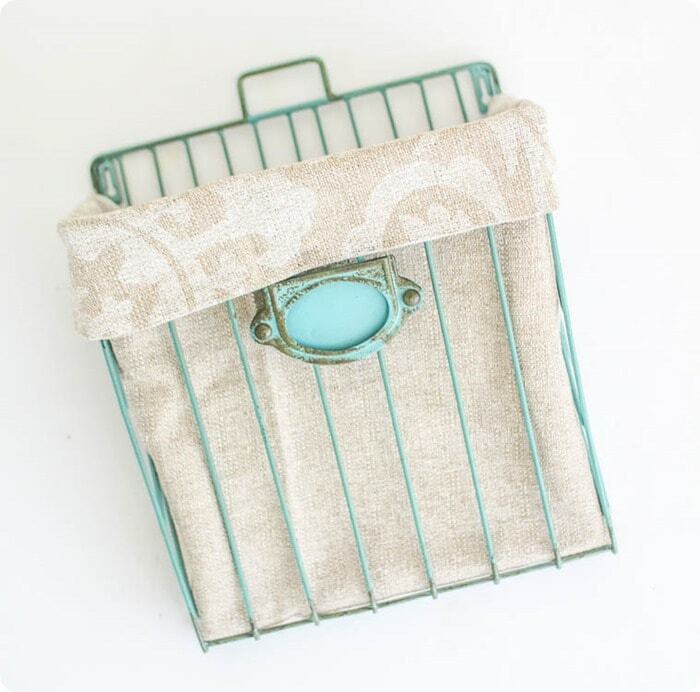 I’m sure it is probably pretty easy to sew a little basket liner, but I try to avoid sewing unless absolutely necessary. So instead I used fabric glue, to turn some scrap fabric into a nice little basket liner. Then it is simply a matter of putting it all together. 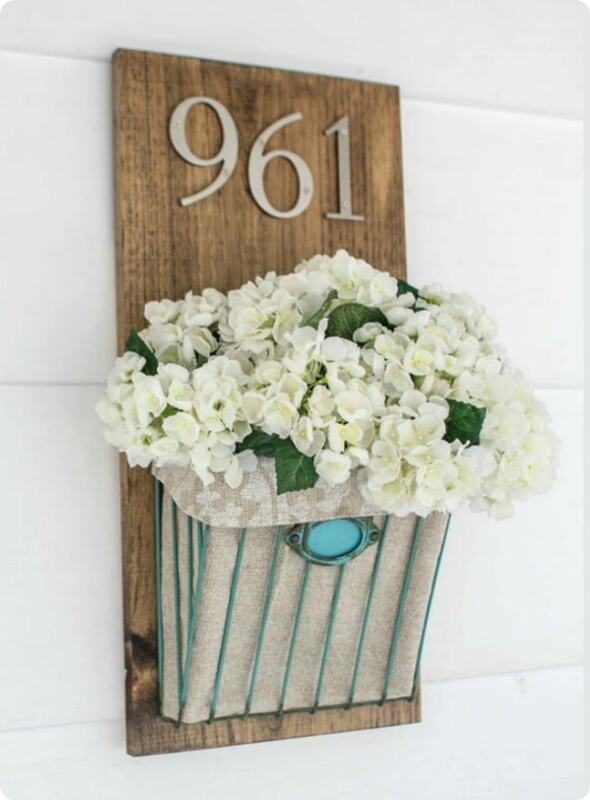 Attach the house numbers and basket to the board with screws. Add flowers or whatever you want and your done. Seriously, so easy. Okay, so a few things. Yes, I did choose to use fake flowers for this instead of adding a planter box and planting real flowers. That was my personal preference because I’m not great at growing things. Also I like the fact that I can easily switch out what’s in the basket as the season’s change. I’m thinking maybe some cotton branches or fall leaves in the fall, evergreen branches in winter, etc. You probably noticed that my new house number is hanging on cute white siding and not the red brick from the before picture. I’m still working on the whole intercom situation, so for now I took photos of my new number on my much more picturesque back porch. 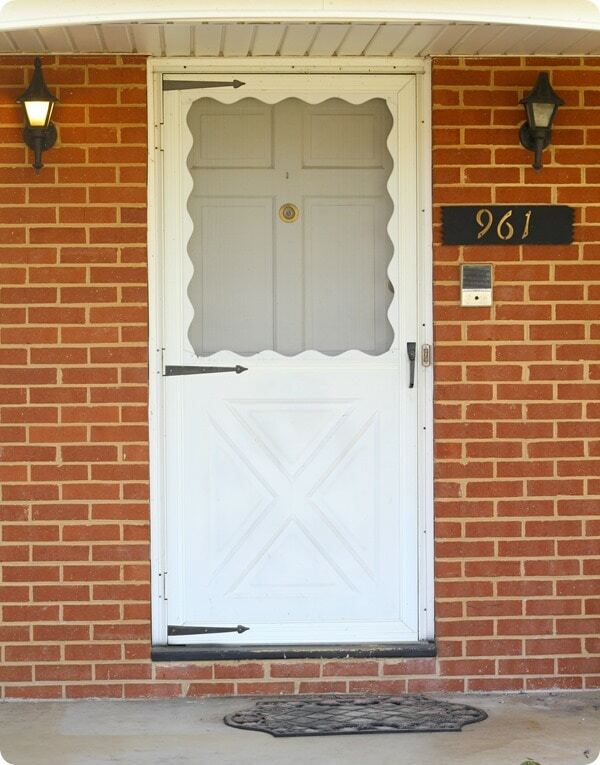 But I am super excited to officially hang this out front and complete my front door refresh this weekend. This makeover is long overdue and it’s going to be a good one! 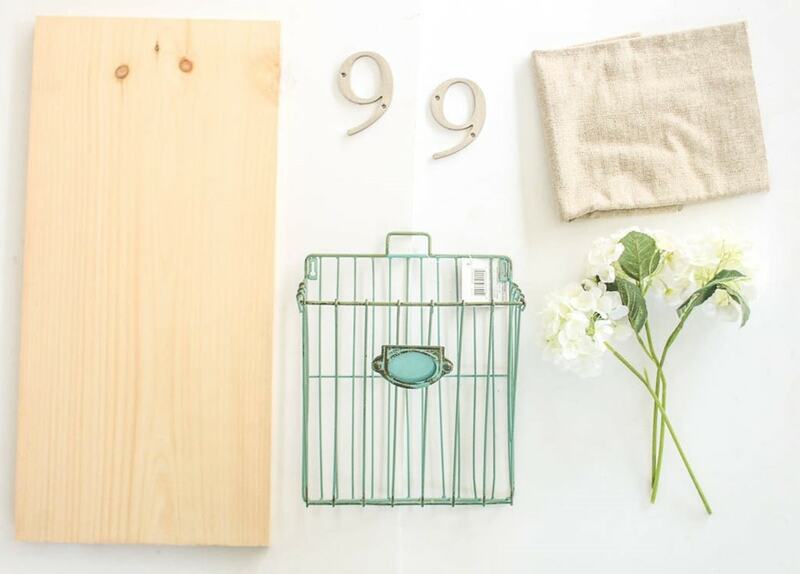 Here are a few basket alternatives I found. Personally I adore that turquoise mailbox, but that’s probably no surprise! I like it! It is unique, does its job and is not “cookie cutter” in the way that looks like something you bought from the store. It’s beautiful. We just bought a house in September and our house number is on the backdrop of a what I call, a cutie Duty, kind of background…with cats…not my thing, I’m may take some inspiration from you and do something along the same lines as you did… If you don’t mind, I think it’s a great idea…what you have created here! I LOVE that this is so simple yet cute! We have brick on the outside of our house too… how do you plan on hanging it/ attaching it to the brick? Hi Ashley! I used a masonry drill bit to drill two holes in the mortar between the brick and then used masonry anchors and screws to hang the house number. I bought the bit and anchors at Lowes for just a few dollars.